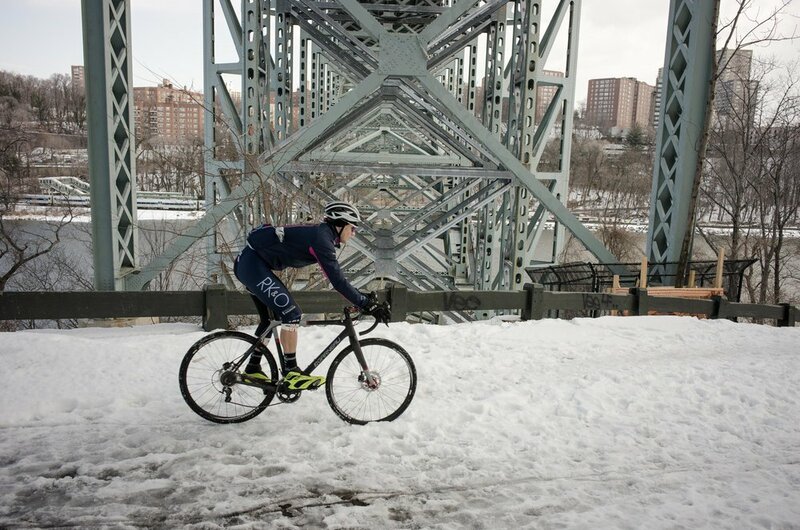 Colin and Roger got their hands on a 2015 Louis Garneau Steeple-X and put it through its paces on a snowy day in New York City. Modern and classic, out of the box Garneau’s Steeple-XC looks pretty slick. The paint job is simple and striking. The matte gray and black with red highlights really works well. Garneau’s Dream Factory also offers your the ability to go nuts with the color scheme of your choice. Need a neon orange and apple green cross bike? LG has you covered. Taking a closer look, there are a few details that stand out. First, the 3T stem, handlebar and seat post look like they were tailor made for this paint scheme – all matchy matchy. 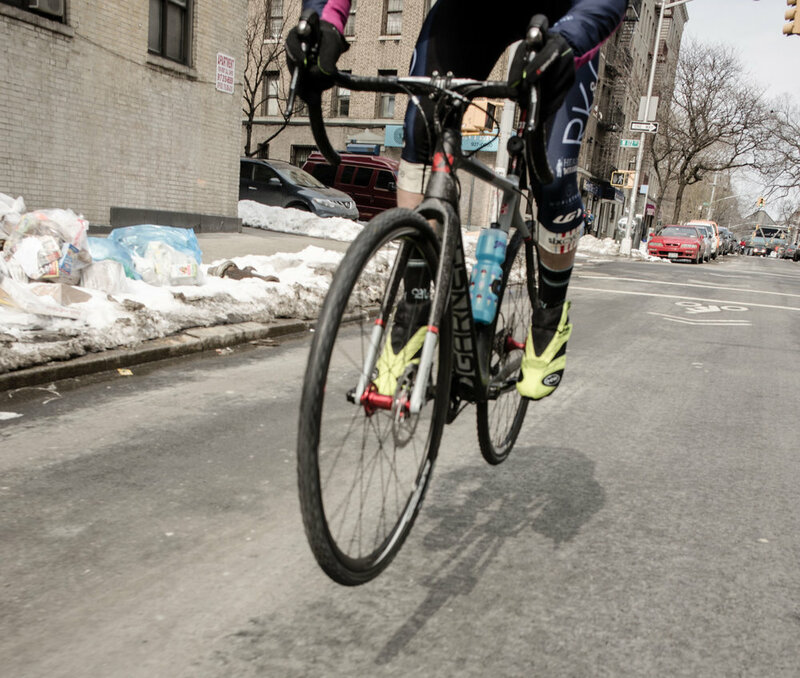 Next, the disc brakes were an obvious feature of this bike… disc brakes have quickly become the dominant majority of performance cross bikes. Save for a few old school racers and builders, most people are seeing the advantages of ditching cantilever brakes for something that can actually stop your bike. LG went one step further with Shimano hydraulic levers and calipers. Last, this bike looks ready to race – aggressive geometry, serious braking, lots of tire clearance, and a front 15mm thru axle. Before throwing a leg over this bike you can see what LG was shooting for with the Steeple-XC. The test bike was a “M” sized bike, which has a 54cm seat tube (center-to-top) and a top tube that is also 54cm long. The head tube is 13cm long. The seat and head angles are 74 and 71.5 degrees, respectively. Chainstays are 425mm and there is 60mm bottom bracket drop. 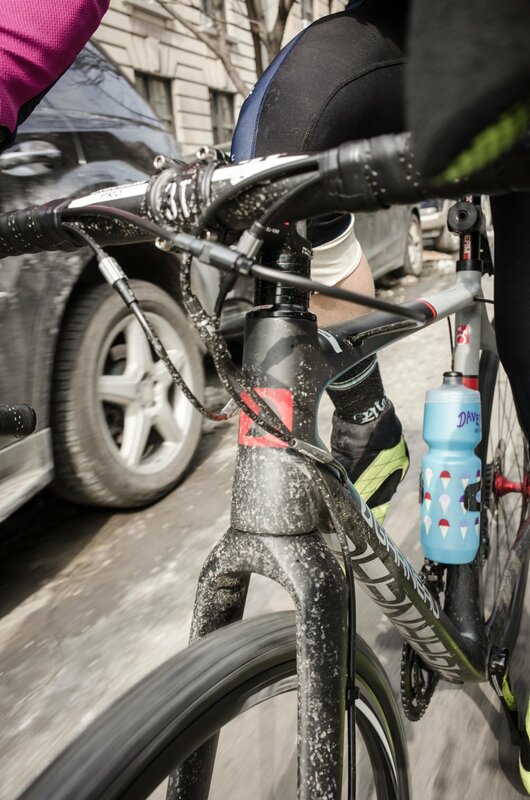 There is tons of room for fat tires – the stock 32 mm tires looked skinny in this frame. The Steeple-XC employs LG’s “no-void monocoque technology”. The fork is Garneau’s cross-specific disc fork with a 15mm thru-axle and 1-1/8″ to 1-1/2″ tapered steerer. Cable routing is done internally to keep them out of the way during shouldering. There are plenty of gears to choose from with an Ultegra 11 speed rear derailleur taking care of an 11-28 cassette in the rear and an Ultegra braze-on front derailleur shifting 46/36 rings in the front. 160 mm rotors are paired with Shimano calipers and levers. As mentioned above, the bar, stem and seat post are 3T. The saddle is Garneau’s “Cadence”. This bike comes stock with Alex ATD490 wheels which are tubeless compatible. 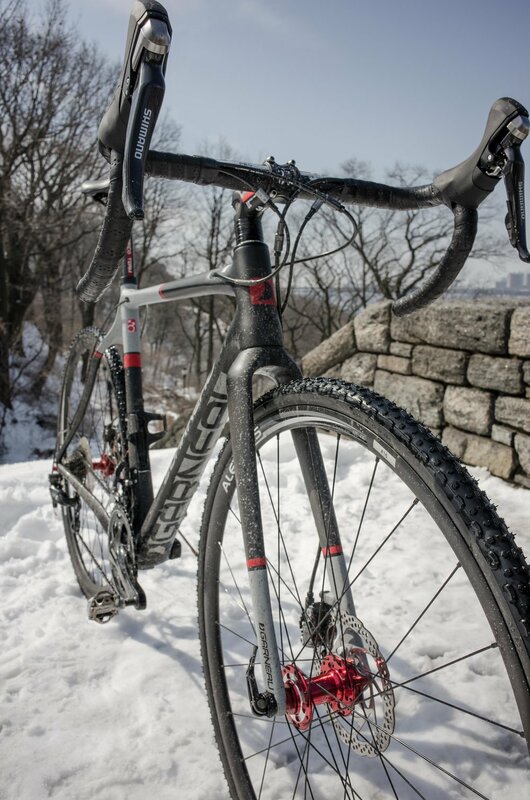 This build used non-tubeless Vittoria Cross XG Pro 32mm tires. 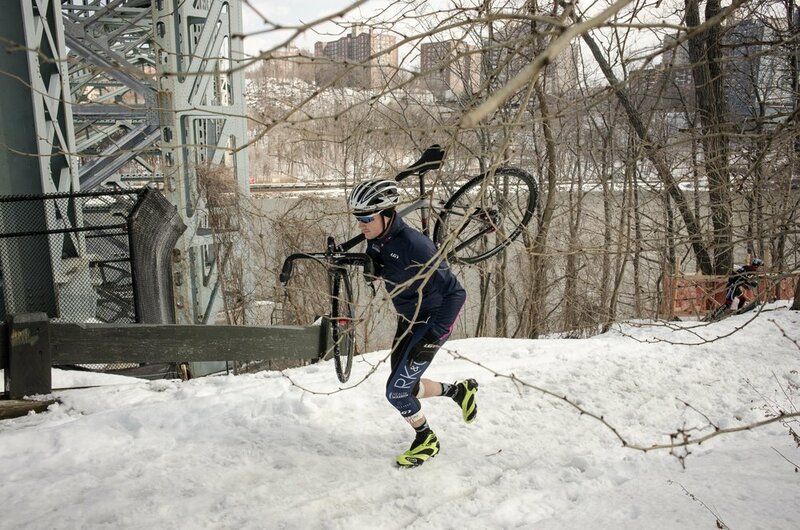 This bike landed in NYC in the middle of one of the worst winters I can remember. Taking the Steeple-XC out for a spin was a good distraction from misery. 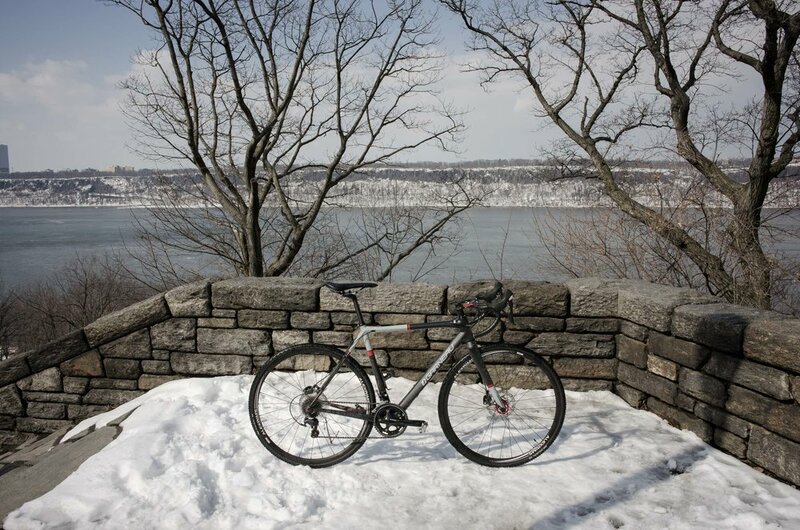 Unfortunately, all the the dirt was under a foot and a half of snow so most of the riding on this bike was done on asphalt or snow covered trails. Right off the bat, I want to apologize to LG if there was any noticeable tire wear. The brakes on the Steeple-XC are so damn good it was hard not to skid the rear wheel any chance I could. The braking up front was also impressive. The 15mm thru axle felt kept the front end solid under hard braking. Shifting was slick and predictable with plenty of range to handle anything you can through at it. The Alex wheelset seems to be an unimpressive choice, but put in the context of racing cross, they make perfect sense. Given the price point of this bike ($3299.99) these wheels keep the price down and work great as a solid set of training wheels. The ability to set these up tubeless has major advantages if you don’t have the cash to spend on a set of race wheels. With the 32mm Vittoria’s mounted there was plenty of clearance for both the frame and fork. This is great for a muddy race or if you wanted to mount some really fat tires. The geometry on this bike is something to pay attention to. I would classify the geometry as new school and aggressive. Compared to a 54cm Ridley X-fire the Steeple-XC (also in a 54cm) has a 35mm shorter head tube and a slightly sloping top tube. This puts the front end a bit low for my liking on a cross bike. Additionally, a more square geometry allows for more room for shouldering. It may be worth investigating the geometry chart before throwing down for the Steeple-XC. I do, however, appreciate the relatively high bottom bracket. Pedaling through turns is not a problem with the LG’s 66mm of bottom bracket drop. On the snowy trails this bike felt bright and light- eager to make changes to it’s line. Although at first skeptical of the non-traditional cross geometry, I was pleasantly surprised on how the bike handled itself once off asphalt. It was easy to point in the right direction and correct a misled line. The bottom bracket is plenty stiff and power transfer felt immediate. I would bet that these characteristics are enhanced with a set of race tubulars. The Steeple-XC is a well rounded cross bike. It is very well specced for its price and leaves room in your wallet for race wheels and tires. Although at first I was thrown off by the geometry, pushing the seat forward and using a few spacers under the stem got me close to the fit I am used to. The bottom bracket drop is neither too low (pedal strike) or too high (raised center of gravity). The frame is stiff, refined and well thought out for use on the cross course. On top of this, the paint is well done – not flashy, not boring. And with LG’s Dream Factory you can get your color-way all coordinated and whatnot. Start building yours up today at dreamfactory.louisgarneau.com.